Better late than never! 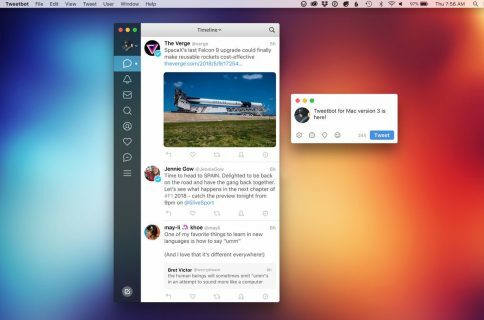 Developer Tapbots has at last unleashed a major update to its popular Twitter client for OS X. Tweetbot 2 for Mac is now available as a free update for existing Tweetbot users. For new users, the application is now available at a discounted price of $12.99, down from its regular asking price of $19.99. 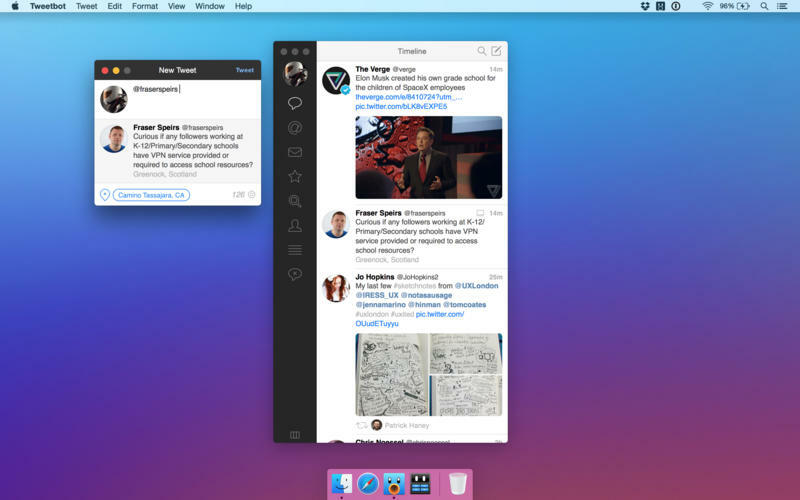 Aside from a fresh coat of paint and a dark translucent appearance on Yosemite systems, Tweetbot 2 for Mac sports an improved timeline search feature, optional verified badges, a three-pane layout that brings order to your lists, an iOS-style interface in the tweet detail view, the ability to see a user’s recent photos and more. 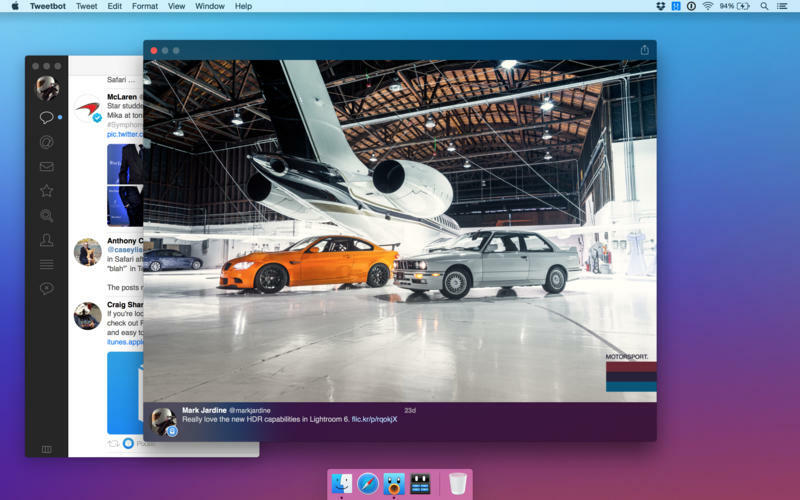 The overhauled interface looks stunning with its flattened appearance, precise typography, revamped profile pages with circular profile photos, iMessage-like chat bubbles and other perks. A new Recent Photos section is now available through a person’s profile view, allowing you to quickly check out the photos they recently posted on Twitter. 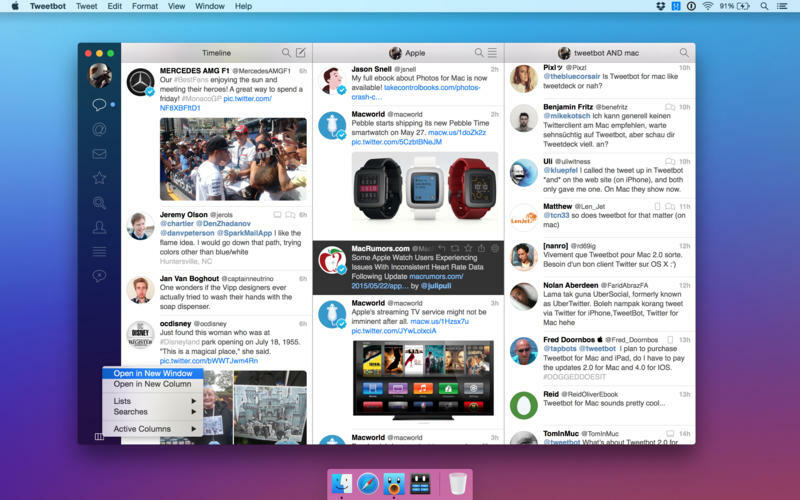 Put simply, Tweetbot now feels right at home on Macs running OS X Yosemite. In addition to flatter controls and Yosemite styling, Tweetbot 2 for Mac will now display verified account badges while giving you the flexibility to organize your lists the way you want. Notice a new toggle in the bottom left corner of the app’s window? Just click it and Tweetbot will switch to a three-pane layout that helps manage your lists. You can choose to view all of your lists created on Twitter or open them in a new window or column. Another enhancement helps you quickly detach a list into its own window by right clicking the title bar at the top. To set a list as your timeline, just right-click on the Timeline title. 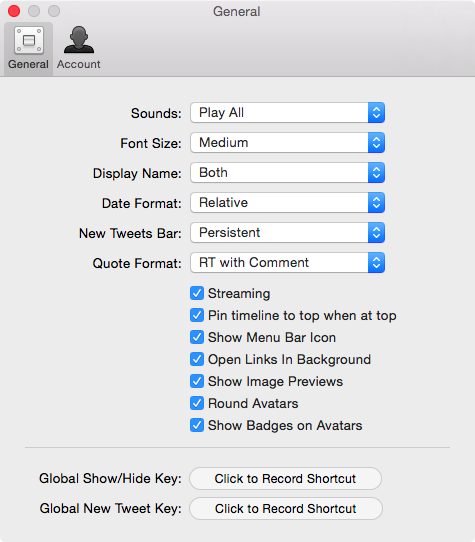 More importantly, Tweetbot 2 for Mac can now search through your timelines more efficiently than before. The search bar is now integrated into the window’s title bar, with a new button next to the new tweet button providing quick access to search functionality. Profile views now use iOS-style layout where the app displays users recent photos, with the option to view their timeline by clicking the tweet counter. The compose sheet where you type in a new tweet is now its own window detached from Tweetbot’s main window. If you click on a photo attached to a tweet, Tweetbot will open it in an improved image viewer that includes the original tweet at the bottom. Tweetbot can also be customized to your liking using new preferences. For instance, you can switch verified badges on and off, or choose between the new circular appearance for profile photos or continue using the old look. And this is the new app icon. While you can still disable media previews in timelines or switch to large images, sadly the medium preview option has been removed altogether. Speaking of feature removals, Tweetbot 2 for Mac also lacks the retweets tab. According to a Tweetbot developer, an upcoming 2.1 update will introduce the ability to display embedded tweets,a feature that got recently rolled out to Tweetbot for iPhone. The app requires an Intel-based Mac with a 64-bit processor and OS X 10.7.4 or later. 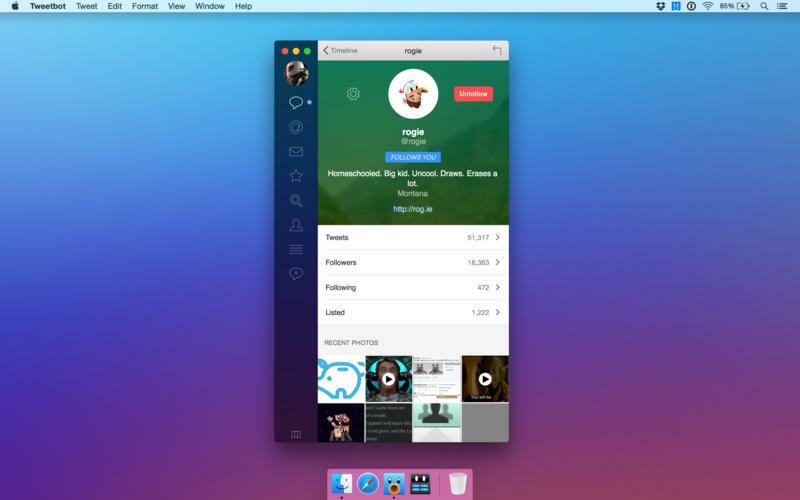 To enjoy the new design, use Tweetbot on a Mac running OS X Yosemite. Tweetbot 2 for Mac is on sale for $12.99 on the Mac App Store.